Walking with Jesus: Day 53: Acts 16:6-10 & Prov 19:16-22 - Are We Really Willing to Trust God's Leading? Day 53: Acts 16:6-10 & Prov 19:16-22 - Are We Really Willing to Trust God's Leading? Are We Really Willing to Trust God's Leading? Our church is planning on taking a mission trip to Haiti this July, to partner with and support the work of Reformation Hope. One of the things we're learning as we meet together and plan is that the best plans are always subject to change, as the Lord closes and opens opportunities to serve. For many of us Americans, this can be difficult to accept. Paul and Timothy had a clear plan for their mission trip. 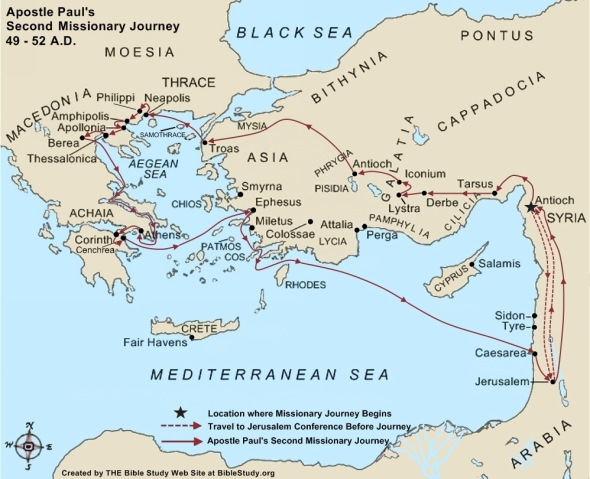 They were going to go into Asia Minor and travel to the cities Paul had visited before and go to some cities he had not yet visited. God said no. For whatever reason, the Holy Spirit forbid them from going to speak the word in Asia. We could speculate as to the reasons, but that's not our responsibility, is it? The kingdom of God is a kingdom, where Christ sits enthroned as King. We serve at His pleasure, doing as He directs. Having been blocked by the Holy Spirit from going South into Asia, Paul and Timothy thought they would go north into Bithynia, "but the Spirit of Jesus did not allow them." Having come such a long way from Antioch, Paul must have been a bit confused at this point. He couldn't go south and he couldn't go north. 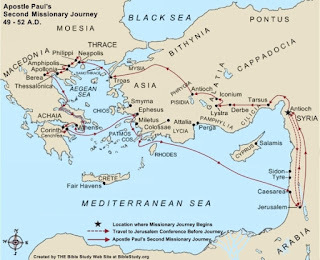 That's when the Macedonian call came to Paul and Timothy: "A vision appeared to Paul in the night: a man of Macedonia was standing there, urging him and saying, “Come over to Macedonia and help us.” Paul now had his marching orders, so he and Timothy crossed from Asia to Europe, from present-day Turkey to present-day Northern Greece. Paul and Timothy would enjoy a wonderfully fruitful ministry in Macedonia, including preaching the Gospel and starting new churches in Philippi, Thessalonica and Berea. When God turns us away from a potentially promising area of ministry, it is because He has something else for us to do, something vital and productive. If we are remaining on our knees before Him, in His word, seeking His face and yielding to His will, God will use us for His glory in the best possible way, the way He ordains. But we cannot be grasping so tightly to our plans and our priorities; otherwise, we may be very frustrated. Heavenly Father, Thank You for not only saving us but also putting us to work in Your kingdom, to carry Your Gospel and serve others in Your name. Each of us who belongs to You has an appointed area of ministry, the place where You have led us and where You call us to speak the truth in love and share Christ with those in need, Make us faithful to Your call. Make our ministry, wherever it may be, fruitful for Your glory! In Jesus' name, Amen. not holding back when we have the ability to help. and wisdom to serve well. so give us the self-control to discipline in love. Father, our souls and our character matter most. We see our own need and how far we are from who we need to be. Make us teachable, that we may heed Your wisdom. Make us committed to Your purposes and not our own plans. Make us committed to the truth, to integrity before You. Make us more like Jesus, we pray in His name, Amen.